If you're looking for homemade facial mask recipes, look no further. 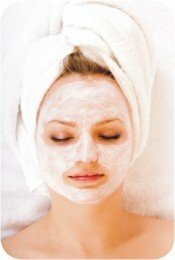 Here are some great rejuvenating and nourishing facial masks you can make for home spa parties or regular weekly beauty regimes. Some seaweeds might not be suitable for your skin type. Some are only used in preparation of herbal body wraps, while others, as kelp, can be used for the face. A natural emollient, it is also and high in vitamins and minerals. The rest of the ingredients will open up the clogged pores and cleanse the impurities, while kelp with help nourish and restore the skin. Combine the kelp powder and aloe vera gel in a small bowl. Add water gradually until the mixture has a consistency of a thick paste. Apply on the face and neck and leave it on for about 15 minutes. Bananas can be seen used for normal skin type face mask and also for natural hair care products. It is versatile and nourishing. It has tons of potassium and vitamin A that are natural emollients and help reduce redness and puffiness. Chickpea flour is a great exfoliator and also a great skin rejuvenator. Blend the chickpea flour and banana into a thick paste. Add the beaten egg and apply the mix on the face and neck. Leave on for 15 minutes, rinse well and pat dry. A nourishing facial mask must have ingredients that provide the skin with agents that restore it and moisturize it at the same time. It has to have vitamins and proteins in it. Avocado hydrates and nourishes the skin. Ideal for dry skin, although it can be used for normal skin type too. It is filled with Vitamin E which restores the skin’s surface and it improves the skin’s texture overall. This mask also has carrots in it which are rich in beta-carotene and anti-oxidants, and also heavy cream which is rich in calcium and proteins. Combine all the ingredients and apply on the face and neck. Leave on for 15 minutes and rinse well. Pet dry. Using a blender, combine all the ingredients until smooth. Apply on the face and neck and leave on for 5 minutes. Store this mask in a glass jar or plastic container and refrigerate. This mask is especially good for dry skin. All ingredients act as moisturizers.